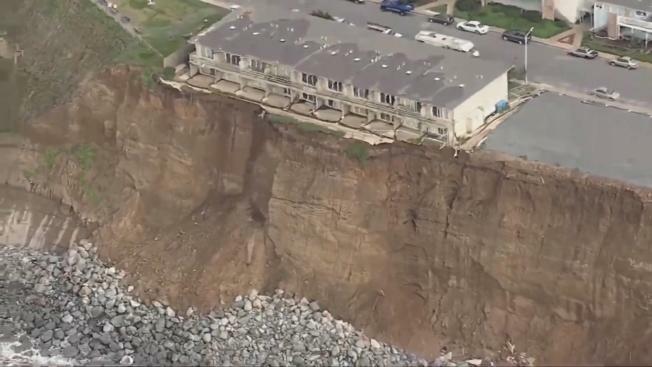 In a unanimous vote Wednesday night, the Pacifica City Council agreed to pay a demolition team nearly $219,000 to tear down a building threatened by the city's crumbling coastline. City leaders approved plans to tear down an apartment building at 310 Esplanade Ave. that is dangerously close to the cliff’s edge. City Manager Lorie Tinfow isn't happy about footing the bill but said she can't wait any longer for building owner Willard Tong to act. "Our discretionary funds that are not already obligated are small," she said. "This is not simple for the city to do. If the implications of it falling to the beach weren't so dire - in other words, if the cost wasn't so much higher - we would not take action." Work could begin as early as Monday, officials said. City officials are expected on Wednesday to approve plans to tear down an apartment building at 310 Esplanade Ave. that is dangerously close to the cliff's edge. Michelle Roberts reports. Resident Dan Stegink told the council to seek grant funding to cover the cost. "We hear a lot about the city applying for grants; we don't hear a lot about us getting money that can take the burden off Pacifica taxpayers and help us out," he said. Tinfow said the city will take legal steps to be reimbursed by the property owner. This building was deemed unsafe last year, but in light of recent storms, city officials fear it is now a public safety risk. Meanwhile, Pacifica crews spent Wednesday cleaning up after a massive oak tree branch fell during Tuesday night’s storm. “I heard a crack and a boom and then I thought it was an earthquake,” said Denise Gernandt. She is weary of parking beneath any other trees on the block, especially after her neighbor’s car was damaged when the branch came down. All eyes are focused on the condemned apartment at 310 Esplanade that is teetering on the cliff’s edge. Residents are waiting for the council to approve emergency demolition plans. “It’s been on everyone’s mind and we’ve been all worrying about it,” Tinfow said on Wednesday. “It does feel good to be able to take the steps to protect the public safety now." On Jan. 25, 2016, the city of Pacifica said the apartments at 310 Esplanade Ave. were uninhabitable due to coastal erosion. Pacifica Chief Building Official Mike Cully “yellow-tagged” the apartments and several homes, meaning residents were allowed to access buildings only to remove their belongings. The city worked with the Pacifica Resource Center to provide assistance to residents as they transitioned to other housing. The property is currently vacant. While the city moves forward with demolition plans, many neighbors are hoping this weekend’s storm doesn’t bring more erosion damage to the growing sinkhole a on the path to a popular beach entry. Crews have been working to repair the sinkhole for weeks. But rain and waves continue to undo the work they’ve put in. On Thursday, when dry weather has been forecast, they will be pouring fresh cement to protect it from rain. The city is also slated to pay to demolish a house on 526 Esplanade Avenue. After recent storms, the property is tottering dangerously close to the cliff's edge. Tinfow said the owner is cooperating. In exchange for the rights to the land, the city will cover the cost of the demolition, which will likely be scheduled sometime in 2017.